Since opening their doors in 2017, London's multi-purpose venue Printworks has grown into the clubbing mecca that the capital so badly needed. Comprised of six vast event spaces, all arranged over multiple levels with a maze of corridors and rooms, the venue has kept the original machinery and industrial features from its time as a fully operational printing press – the Press Halls are also fully soundproofed and were once western Europe’s largest print facility. With an opening season which boasted performances from Nina Kraviz, Ben Klock, Hot Since 82 and Daphni, and parties from Snowbombing, The Hydra, Paradise and RAM – Printworks fast gained recognition as a space providing the best in electronic music in London. Now moving into their 2018 Autumn/Winter series, EARMILK have hand picked six performances that you can't miss this season. Featured previously in EARMILK, Mosaic curated by Maceo Plex is heading to Printworks in a techno storm. With the likes of Maceo, Ellen Allien and Len Faki in the print halls, Room 2 will play host to a highly anticipated b2b with Danny Daze and Anthony Parasole – two American DJs with a reputation for providing the very best in hard hitting, all consuming techno and electro. From her phenomenal Sugar Mountain Boiler Room to sets at legendary stronghold Berghain, Honey Dijon is the queen of all things house, techno and disco – joining the likes of The Black Madonna, Artwork, Peggy Gou and Mella Dee at Smirnoff's Equalising Music Presents. Launched in 2017, the Smirnoff Equalising Music initiative began a three-year global project to escalate the gender parity in the music industry by 2020. With prior Hydra shows at Printworks noted as some of the best the venue has hosted, they return this season with not one but four showcases – with performances in the pipeline from Mount Kimbie, Todd Terje and Detroit house legend Moodymann. On the 27th October, Jacques Green will play Printworks Press Halls alongside Jeremy Underground and Romare. The Canadian DJ and Producer released his long awaited album Feel Infinite in 2017, a testimony of his abilities to blend genres, creating completely original and authentic sounds. With Afterlife now the globally recognised home to a particular ethereal and dream-like style of emotional techno, they return to London's Printworks after another stellar year with an Ibiza residency and shows worldwide. With ten years of experience working together as DJs and producers Adrian Shala and Adrian Schweizer, aka Adriatique, are the masters at curating relentless and hypnotic sets for a fully immersive experience. They duo join Tale Of Us, Recondite and Agents Of Time at the event on 24th November. After multiple requests and pleas, The Wizard Jeff Mills will headline the final Hydra party at Printworks. The Detroit techno icon will join fellow legend Marcel Dettmann and a highly anticipated live set from Octave One in the Press Halls. In the Dark Room UK Techno progenitor Tony Child AKA Surgeon debuts the Live incarnation of this year’s ‘Luminosity Device’ album, another unmissable performance. 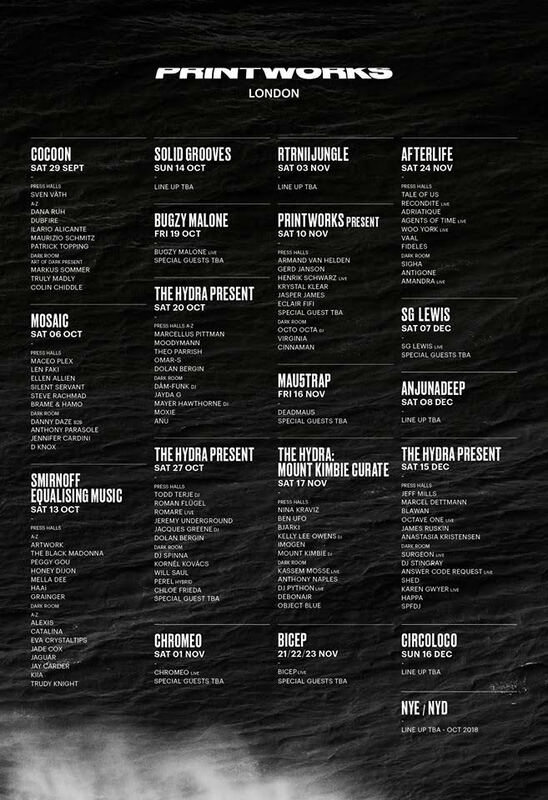 Tickets are available for all Printworks shows on Resident Advisor through general sale and re-sale HERE. Club · Dance · Events · Events Stage · Lists · Techno · U.K.